Maeve: One day, my mom came up with the ‘greatest’ idea!! Mom: I often feel guilty that I allow life’s busy-ness to get in the way of time with my children. 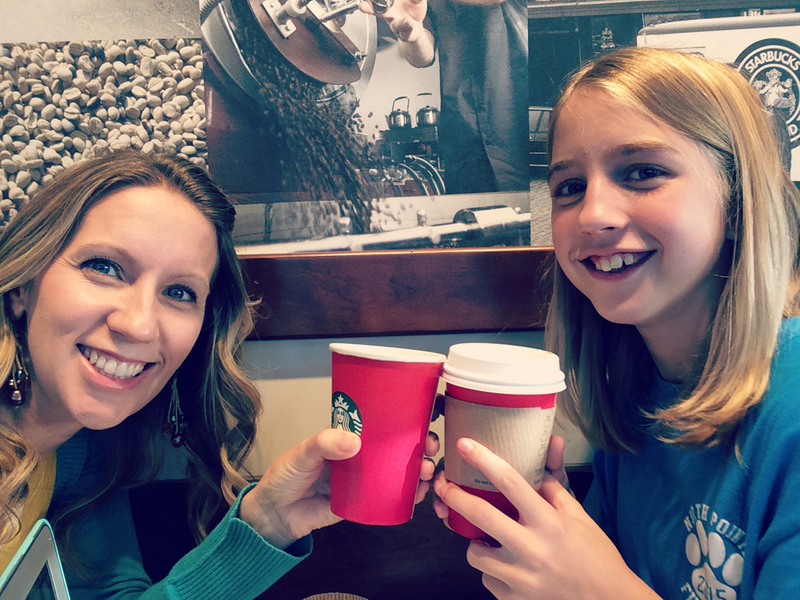 To make up for it, I find myself looking for big, special things to do with each of my kids. 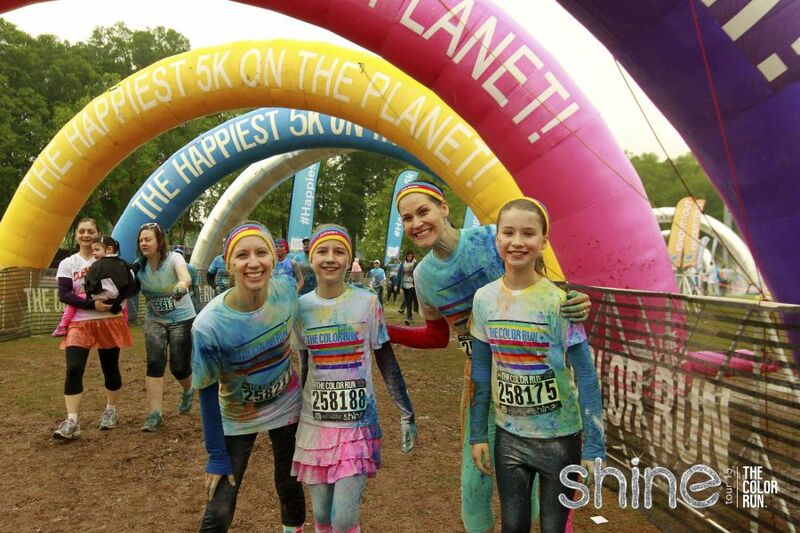 And I thought I found the perfect big moment to share with Maeve…the Shine Color Run 5K! I mean, what girl wouldn’t love the idea of running freely through color and glitter, alongside her favorite friends (and mother)? Maeve: Well, I wasn’t so sure about it, but Mom got us all ready for the run. We went to sign up, buy some things in the Color Run store, and get our supply bags!! She even downloaded the Couch to 5K app for us on her phone. I did NOT like it!! Whenever the monotone voice said ‘walk,’ I walked like a zombie (A.K.A very,very,very,very,very,very slowly), and whenever it spoke, ‘run,’ I hardly even jogged!!! Mom: Yeah, I guess I didn’t really think it through completely. When I get an idea, I just want to go for it! I’m not so good at the thinking it through part. Maeve and I are NOT runners! Honestly, I’ve never understood how people find joy in all that heavy breathing, serious sweating, and repetitive motion. But I didn’t think about any of that. I just thought: Colors! Glitter! FUN!!! 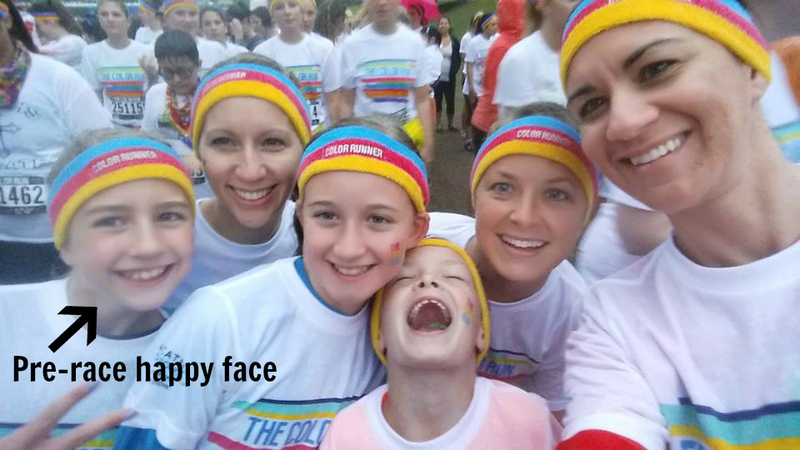 It is the #Happiest5K after all. Mom: It was anything but the perfect day for running a 5K. But I was not going to let the weather bring me down. I was ready for a fun day with my favorite girl and some friends we love! Mom: It really was pretty cold and nasty. Our runner friends took off, but we took it a little slower. Thanks to the downpour, the ground had become a mushy mess, and mud consumed most of the color. We were splashing through mud puddles, all popsicle fingers and toes, trying not to choke on the colored powder we couldn’t see being thrown in our direction. Maeve: I was about done with all this nonsense, when suddenly, I saw these huge colorful arches made with big letters saying F-I-N-I-S-H! I just about leaped in the air with excitement! And just in the nick of time, too. I was DONE. Mom: Those arches were like a beacon of hope. Haha. It was the only time Maeve picked up her pace above lifeless. 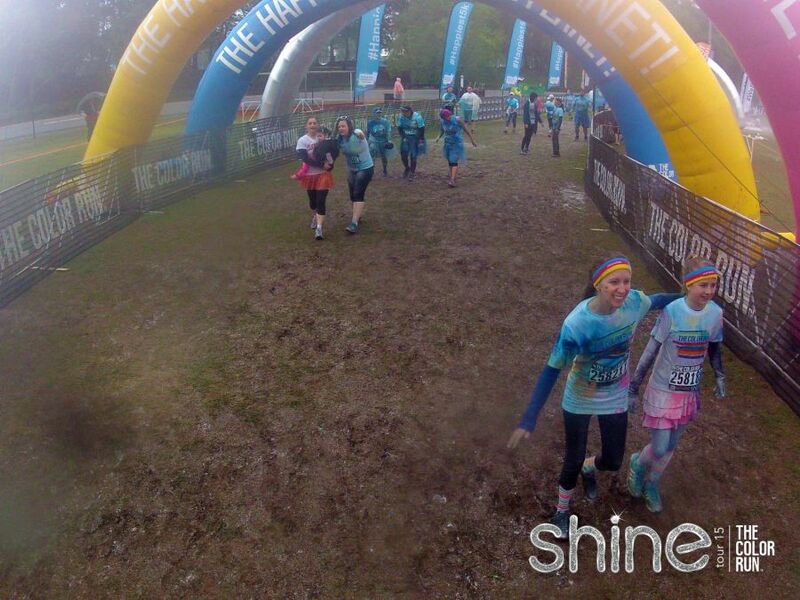 She sprinted to the finish line, so happy to be done with this mess of an event that her mother had planned. 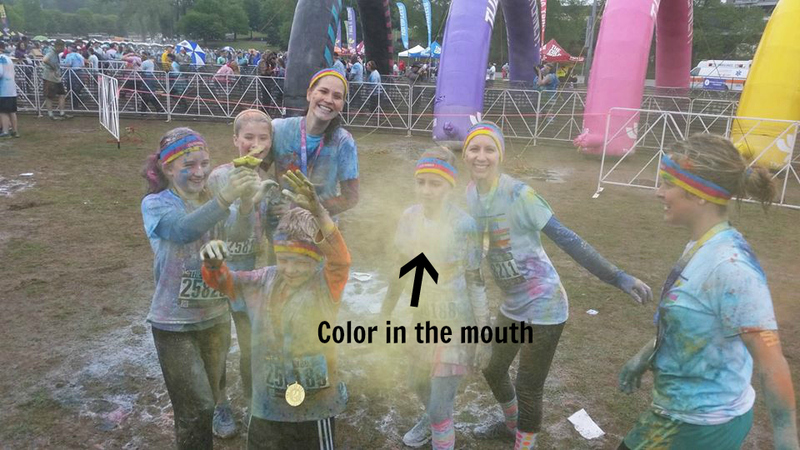 As we crossed the finish line we were each handed a medal, a pack of color, and a pack of silver glitter. Oh yeah, it was time to celebrate! Mom: We enjoyed a little “hang out with our friends NOT running” time, and then we trekked to the car. We were all ready to get home, take a hot shower, and snuggle into our warmest sweats. I think it’s safe to say that Maeve enjoyed the idea of the Color Run together after she was dry and warm at home. But I learned a lesson from it all. I don’t have to work so hard to create big special moments to enjoy time with my children and show them I love them. (Especially big special moments that involve running in the freezing rain.) I just need to give them time. And attention. To separate myself for a moment from work and cooking and cleaning and give them some eye contact. To pay attention to the little things they want to do and say yes to those more often. 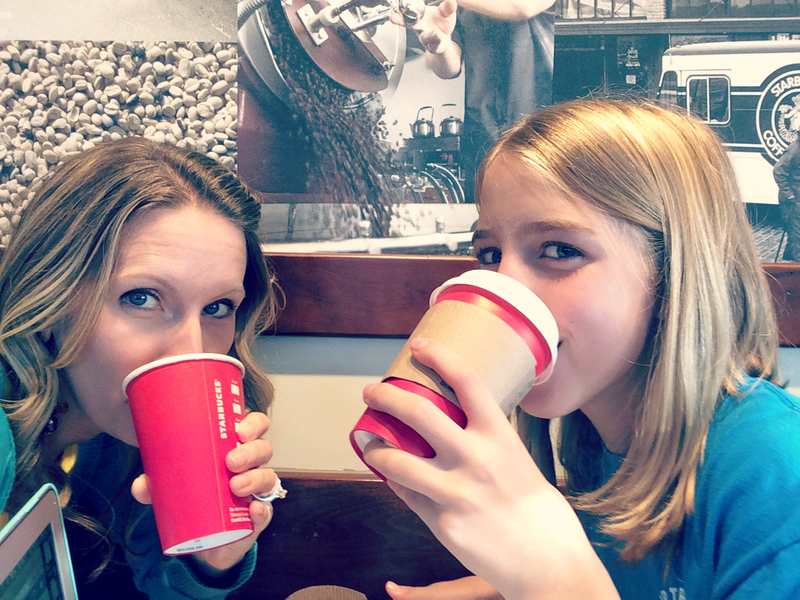 So, when we have a second to ourselves and Maeve asks to go to Starbucks (even though I think it’s overpriced and overrated) I need to say yes. Those are the moments that are big and special in their little hearts. The moments that feel like love. Maeve: Yeah…That’s for sure! Like, for instance, right now we’re sitting at Starbucks writing this. Nothing big, you know, but I love it!! 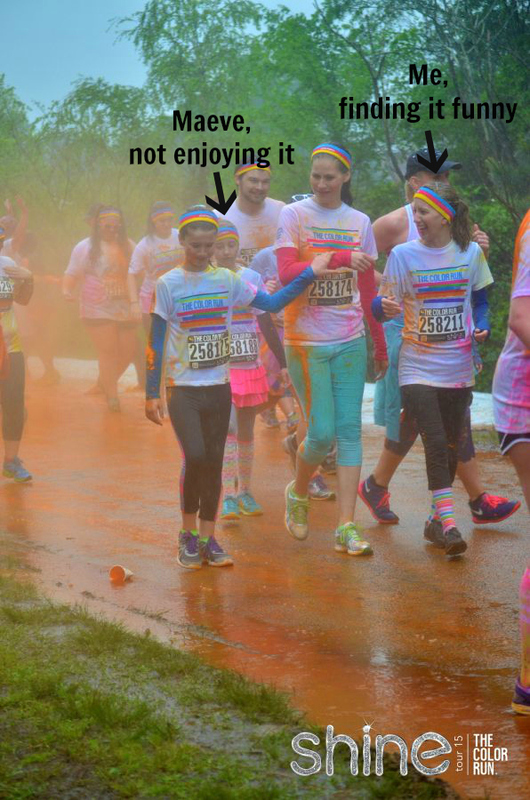 Anyways, I don’t think we’ll be doing the Shine Color Run this year. Maeve OUT!!!! (Drops mic.) No, literally! I have to go do my homework. Peace out!! Mom: Drops mic? She’s a mess. I sure do love her. Mom: Most of the time, it seems like our whole life is lived in this space called “rushing”. Rushing from one activity to the next, from the grocery store to the dinner table…on and on. It can really wear on your spirit and cause you to forget that life still happens in the moments between. We call them the minivan moments around here. 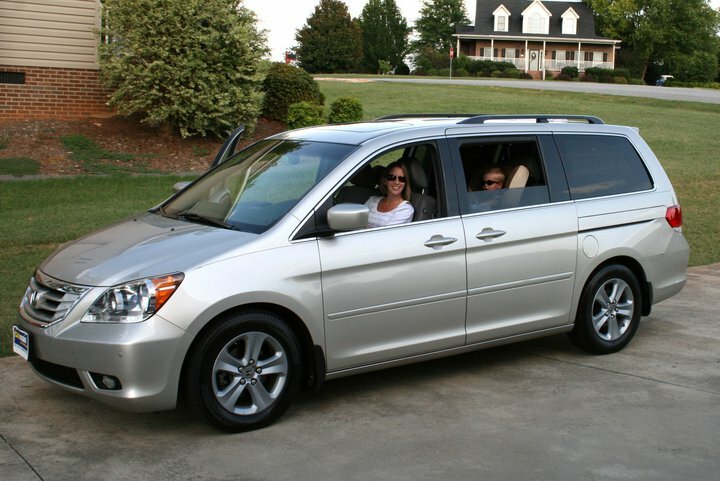 So much of our life happens in the minivan that we have to be intentional about living them just as big as the moments that happen when the doors open (automatically…thanks to the minivan!). Maeve: So true…from school to home, back to school, dropping friends off, back home, to Grama’s house, then piano, soccer, Walmart, and finally home. Can you relate? It can be tough, but you have to make the most of it. So we play I Spy and sing songs from Veggie Tales to Frozen. And every once in awhile, we like to take off on an adventure. 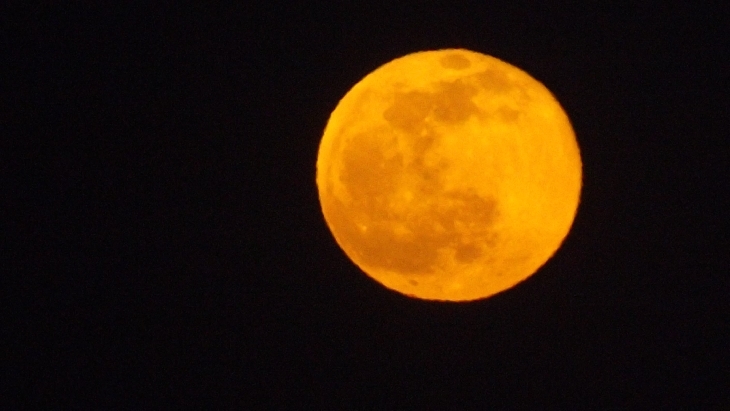 Mom: One busy night in the middle of a busy week, as we were driving home for the evening, we noticed the moon. There was no way NOT to notice it, really. It was giant and orange and glowing…it was all magic and possibility. And so, on that busy night in the middle of that busy week, we took a deep collective breath and allowed ourselves a moment of magic, and we took off on an adventure to chase that moon down. Mom: For a moment, I froze. What had just happened? That bang was LOUD. 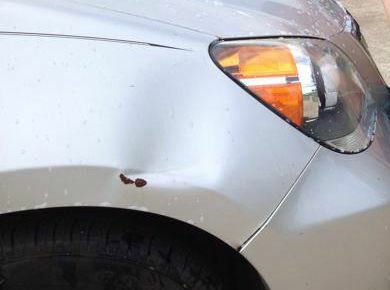 My worrying took over and I wondered…had I hit a deer? A dog? A human being??? I stopped the car and jumped out to investigate. I immediately realized that I should have had my eyes on the road…I’d hit a garbage can pulled out to the road for trash pick up! And there was a nice big dent in the side of the van to prove it. Maeve: And here’s the funny part. My mom thought she needed to apologize for hitting the trash can. There was a man getting into his car in the driveway, so my mom walked up to tell him she was sorry because of course she thought he lived there. But the man gave her a curious look and replied, “Um…I don’t live here.” Mom, embarrassed, said, “Oops. So sorry,” and hurried back to the van. Mom: Yeah, that was an awkward moment for sure! But once we drove away, we all burst into giggles. I mean, who goes chasing the moon and runs smack into a trash can? Try explaining that one to the insurance company. Or your ever-so-logical husband. We got home and examined the side of the van and the kids begged, “Please don’t get it fixed! It will help us always remember this night.” And so…we didn’t. And it remains our favorite ever minivan moment. Maeve: We hope you can take this story as a way to live life. Seek adventure and treasure whatever life throws at you…whether it’s an F on a test or a trash can on the side of the road. Mom: And know that the best adventures can happen on a busy night in the middle of a busy week when you are tired and hungry and whiny and ready to just be home. 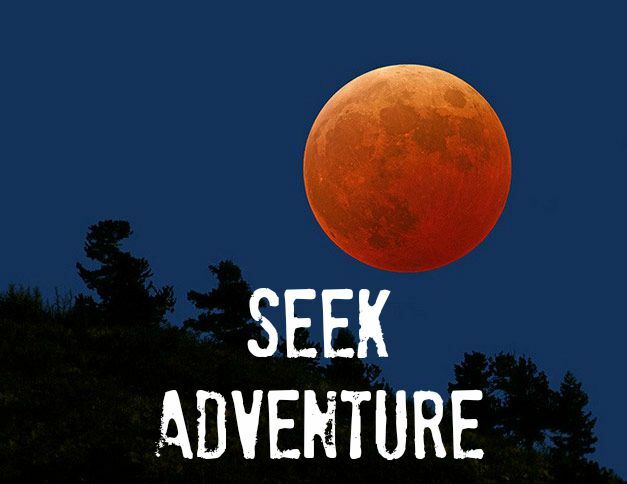 We hope you find your own moon to chase this week.